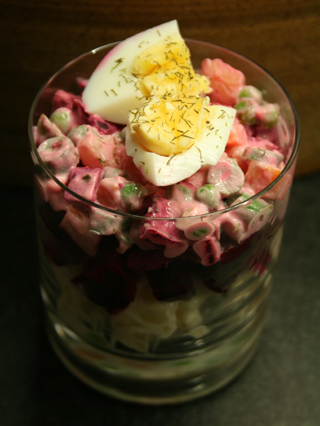 The jury’s out when it comes to the ‘Russianness’ of this salad. Some say that it’s actually Italian and should be called ‘insalata russa’. All I can say in its defence is that I ate it a lot when travelling across Russia. It was a staple in railway buffet cars and one star hotels where I suspect it was made with tinned vegetables but I still found it tasty enough to attempt to recreate the dish at home. This salad wouldn’t be considered a looker (unless you’re a three year old girl with a Disney Princess/colour pink obsession) but it is still delicious considering how easy it is to put together (although perhaps this is just because anything smothered in mayonnaise tastes good). It’s also a great way to disguise lots of vegetables (although my four year old son, who prefers blue, is rather suspicious of the colour). If your beetroot is raw then roast it in the oven (whole with the skin on) in a baking dish covered with foil at 160oC for one hour. Leave to cool then top and tail, peel off the skin and chop into small cubes. If you’re using pickled beetroot then just drain and chop into small cubes. Peel and chop the potatoes into quarters then boil for 5-7 minutes until tender. Drain, leave to cool and chop into small cubes. Chop the carrots into small cubes, slice the beans thinly then blanch all of these with the peas in boiling water for one minute. Drain and plunge into cold water to stop the cooking process, drain again and set aside. Chop the gherkins into small cubes. Cook the eggs in a pan of boiling water for 8 minutes. Cool in a pan of cold water, peel off the shell and chop into quarters. To assemble, mix all the prepared ingredients together with the mayonnaise (leaving some of the chopped egg as a garnish) and put into small bowls or glasses. Garnish with the chopped egg and fresh dill. If you want to work the presentation a little, then mix everything except the beetroot together and spoon two thirds of the mix into glasses. Then spoon over two thirds of the beetroot. Finally mix the beetroot with the remaining potato mixture and spoon this on top. You will then have distinctive, white, red and pink layers which I think looks a little more pleasing than all pink. As usual the Sunday supplements and glossy magazines are full of diet tips for the New Year but I’m a firm believer in NOT dieting in January. The cold weather, dark nights and lack of parties just makes it far too cruel – better to wait until spring I say (if ever). I am however trying to eat a little bit more healthily than over the Christmas period, which considering the rubbish I ate isn’t particularly hard. We also spent a few days after New Year in Scarborough eating lots of wonderfully unhealthy seaside fare (fish and chips, ice cream sundaes, bags of fresh-from-the-oil donuts) so some hearty, wholesome food for January is definitely in order. 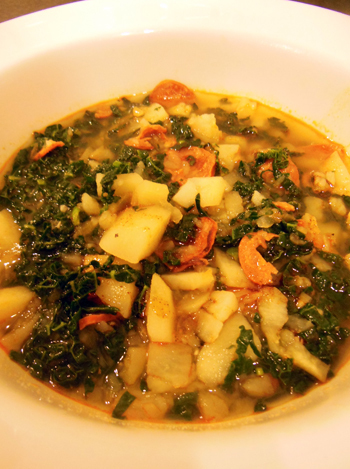 We’ve been making Caldo Verde – a Portuguese soup – for quite a few years now but rather infrequently. Every time I eat it I bang on about how nice it is considering its humble ingredients and ask why I don’t make it more often. It’s super easy and you’d think that using water instead of stock would make it rather bland but it’s actually very, very tasty. If you think soup on its own isn’t a proper meal then you could add a large chunk of bread on the side, but even my bread monster husband doesn’t see this as necessary. This dish is also very economical which is good if you spent a bit too much on Christmas. Heat half a tablespoon of olive oil in a large pan and sauté the onion, garlic and chorizo for a couple of minutes, until they begin to colour. Add the water and potatoes and bring to the boil. Simmer until the potatoes are soft (between 5 and 10 minutes). While the potatoes are cooking prepare the kale. Wash well and remove the coarse white stem running up the centre of the leaf. Then slice the leaves as thinly as possible. I find the easiest way to do this is to take several leaves at once, place them on top of each other and roll to form a rough cigar shape, then chop with a very sharp, large knife. Once the potatoes are cooked, remove the pan from the hob and using a potato masher mash the potatoes into the soup so that they break up. I like to leave some bits fairly big. Season with about ½ teaspoon of salt and about 10 twists of the pepper mill (or to your preferred taste), then add the kale and return to the hob. Continue to simmer until the kale has softened, this will only take a couple of minutes. Check the seasoning and then ladle into large bowls. I like to drizzle 1 tablespoon of olive oil mixed with ½ teaspoon of smoked paprika over the top of each serving for an extra punch but if you’re being healthy you could leave this part out. 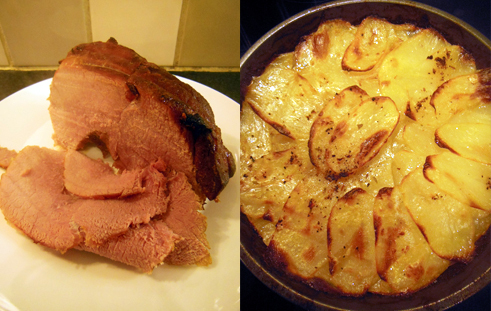 Gammon is so uncool – it’s one of those foods that conjures up images of old people’s homes and really bad pub food. And I’m not going to do its reputation any favours when I tell you that when recuperating from a sickness bug that floored my entire family and made me lose my appetite for an entire week, this is the first thing that I actually fancied eating. And who did I turn to for a recipe to cook this unfashionable foodstuff but the most uncool of cookery writers – Delia. I’ve cooked this dish many, many times and I don’t bother experimenting with other recipes because it works so well. First you boil the joint in cider which is a good way to use that run-of-the-mill stuff (like Strongbow) that sits around going out of date after a big party. Nigella does a similar thing with coke (the fizzy drink sort) which sounds bizarre but is probably nice and I’ve also seen recipes using ginger beer. As a Sunday roast gammon is the boring one, the one that doesn’t come with anything – no stuffing, no Yorkshires, maybe just a splodge of parsley or mustard sauce (which I couldn’t stand as a child). But the great thing about a nice bit of gammon (and something that you only really appreciate as an adult who has to cook their own dinners) is that you can do so much with the left overs. A couple of slices are great with oven chips and a fried egg, or you can slice into thin strips and toss with linguine, egg yolks and parsley for a carbonara type dish. But for me sliced in a sandwich with English mustard is the best. Some people serve gammon as an addition to turkey for Christmas dinner. That’s never been a tradition in our family but I think it sounds like a nice idea and this recipe would be perfect because you could do the boiling part a day or two before and then roast on Christmas day once the turkey is out of the oven resting. Put the gammon in a saucepan and cover with cold water. Bring it to the boil and then throw out the water which will look disgusting – all grey and foamy. Now add the bayleaf, peppercorns and onion and pour in 425ml of cider and enough water to cover the meat. Bring to the boil and simmer gently for one hour. Remove the gammon, let it cool and then remove the string and skin with a sharp knife. If you are doing this part in advance then wrap in cling film and store in the fridge until ready to roast. 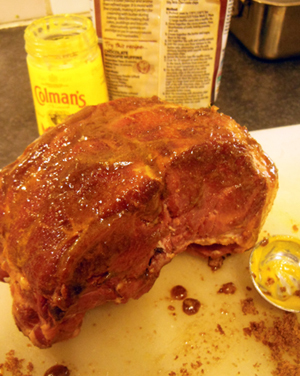 Stand the gammon up (fat side uppermost) and smear the mustard and brown sugar over the surface – it’s easiest to do this with your hands. Then put the joint into a roasting pan with the remaining cider in the bottom and bake in the oven for 45 minutes, basting the joint a couple of times with the juices. NOTE: In the original recipe Delia studs the gammon with cloves all over before roasting. This probably looks prettier but I don’t bother with this as I find the taste of that many cloves a bit overbearing. Smeared with mustard and sugar before entering the oven. Take 5 medium sized floury potatoes (I use Wilja). Cut the potatoes as thinly as you can with a sharp knife (or with a mandolin if you have one and can be bothered to get it out and wash it up). Generously butter a shallow tin (mine is 23cm diameter and 4 cm deep) and layer the potatoes in the tin overlapping them slightly. I save the neatest ones for the top. – you want about 4 layers. Crush two cloves of garlic and add this to 250g of chicken stock (made up with half a Knorr chicken stock pot), along with 10 twists of the pepper mill. Pour the stock over the potatoes until it comes to just under the top layer (you may not need it all), then dot the top of the potatoes with butter. Bake in the oven at 180oC fan for 40 minutes foil-covered and then 30 minutes without foil or until the top is brown and crispy.